You give your toddler a kiss, tuck her in her little bed, and then she cries, “No! No night night! Don’t go!” You hand her a favorite toy bunny, tell her you will be around the corner, and close the door. You hear tiny feet shuffling down the hallway just as you enter the kitchen to finish the dinner dishes. Your toddler is out of bed. You walk her back to her bed. You tuck her in and close the door. She returns a few minutes later. You let out a big sigh and walk her down the hall again. Healthy sleep promotes brain development. The brains of infants and toddlers are growing during sleep times. The brain grows rapidly during this time of life. Sleep times during the first three years of life are especially important for healthy brain development. Healthy sleep promotes self-regulation. Self-regulation refers to how the brain and body work together to control emotions, attention, and thoughts. Self-regulation is the foundation of early childhood development. A well-rested child has an easier time coping with big emotions and transitions through the day. Proper rest helps children sustain attention during play. Well-rested children have an easier time learning and exploring new things because of their increased ability to self-regulate. Healthy sleep is important for physical health. New research indicates proper rest is connected to healthy growth patterns. A well-rested child is better able to fight off illness, maintain a healthy body weight, and have better overall physical health. Certain hormones that help with the repair and growth of cells are only released during deep sleep. Research also indicates that the whole family’s health is improved when parents and other adults who live with young children get healthy sleep. Mindfulness, or being aware of our own feelings in the moment, can be an important way to manage stress. Bedtime battles are stressful for caregivers during all stages of early development. 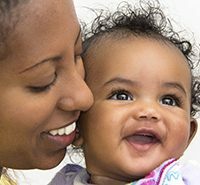 Challenges can begin from the newborn days with a fussy baby who is difficult to soothe, into the infant stage when your baby stands in the crib crying, and continue to the toddler times when your child keeps leaving his bed for one more kiss or hug. If your child was in the neonatal intensive care unit or has had health issues that interfere with sleep such as sleep apnea, you may find yourself continuing to worry about your child’s health during sleep. Your child senses your stress level, and this can make it hard for a child to calm down. 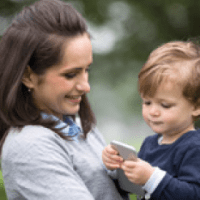 This is because young children and their caregivers are connected through emotions. As a caregiver, try taking a few deep breaths and saying to yourself or your child, “I’m helping you with sleep so your brain and body can grow.” Imagine warm and cozy thoughts. Remember that your children’s sleep space is a haven that allows them time to grow and develop. This mindful self-talk can help you keep focused on your goal of helping your child sleep. Being calm in the moment can help you soothe your child. Talk with your child’s health care providers or your EI providers to come up with a sleep plan that is workable for your family. This issue’s EI Note contains ideas for creating a healthy sleep space and routine for your child, and we hope you will find many ideas that will help your family have restful and restorative sleep so you will have energy to play and learn together. Rebecca Swartz, Ph.D., is an early learning specialist with the Illinois Early Learning Project at the University of Illinois at Urbana-Champaign. 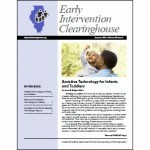 Did you know that each state sets its own rules for early intervention services? If you are planning to move to another state, be sure to discuss your move with your service coordinator. Find out what the requirements are for services in your next state by calling the state agency that provides early intervention. Ask if your child will be eligible and what you need to do to start services again. Be sure to ask for copies of your child’s evaluation, Individualized Family Service Plan (IFSP), and service plan notes so that you can share this with your new providers. Early intervention services in all states end on your child’s third birthday. If you plan to move when your child is 30 months or older, be sure to have a transition planning meeting with your Illinois EI team before you go. You can find out about the types of services likely to be available for children at age 3 and be ready to look for services in your new home. A helpful resource for you is When I am Three, Where Will I Be? Find it at our website under state of Illinois publications. It contains information that can help you plan whether you live in Illinois or move to another state.